The world cup 2014 was approaching and fans from all nationalities, cultures and languages were beginning to feel its pulse. At the same time LIDL, the leading grocery retailer in Europe, wanted to push their image as an innovative and surprising brand. 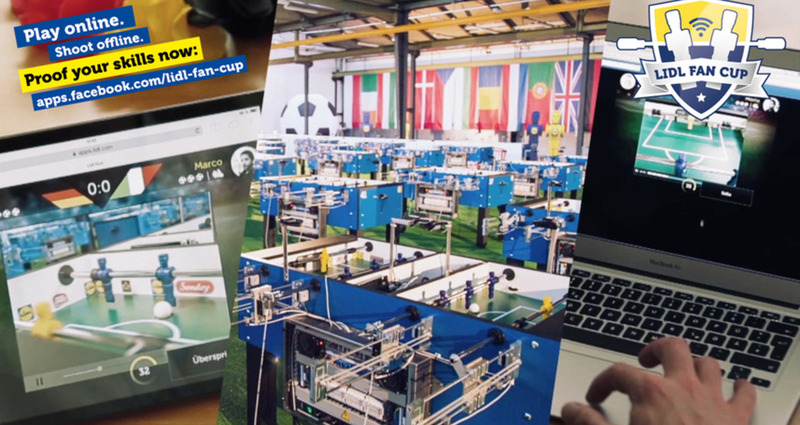 The Lidl Fan Cup was an enormous European foosball tournament. It was aimed at all football fans and Lidl Facebook Fans alike. Our goal? To transport the emotions of shopping at Lidl by letting fans experience the scoring of a goal for their own country. In a 6-week tournament, fans from 23 countries engaged online, shooting offline on real foosball tables. To bring our idea to life, we did something never done before. We engineered 50 electromechanical, web-connected foosball tables. The 50 tables, each with 2 playing fields, were branded with 25 Lidl product lines. After each move the playing fields were randomly switched. The banners were displayed as Arena Brand Names 2 seconds before the game started. The Intro of each replay included 25 different camera flights over the foosball tables. The replay itself showed the branded banners, which were visible for 6 seconds from three different angles. And at the end of the score, once again the arena brand name was displayed. Some countries additionally displayed Facebook-user targeted Intros with special brand cooperations. Finally, every user saw advertising for 84 seconds per game, but this was only seen subliminally and not perceived as actual advertisement, because to soccer fans are used to arena brand names as well as branded banners. The 50 tables, each with 2 playing fields, were branded with 25 Lidl product lines. After each move the playing fields were randomly switched. 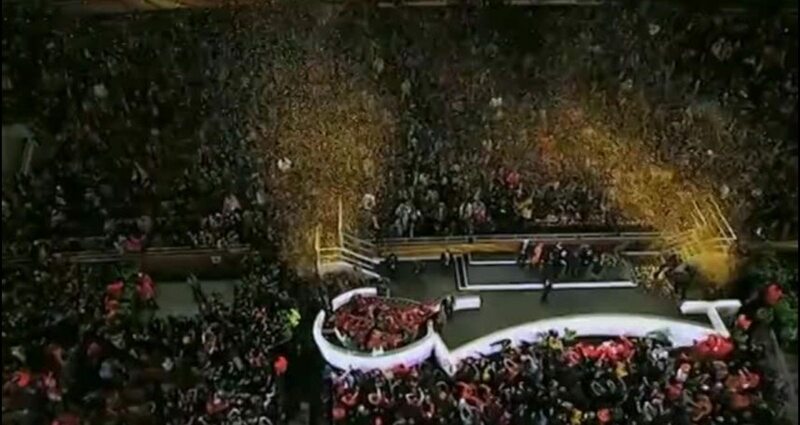 The banners were displayed as Arena Brand Names. Some countries additionally displayed Facebook-user targeted Intros with special brand cooperations. Finally, every user saw advertising for 84 seconds per game, but this was only seen subliminally and not perceived as actual advertisement, because to soccer fans are used to arena brand names as well as branded banners. And the winners got voucher to shop at the local Lidl stores. Player engagement of over 10 minutes per visit, countless shares on Facebook and twitter, an increase of followers of more than 500.000 Fans for Lidl. That is 300% more than the average number of new Fans during this period. And with broad coverage by several media channels in Europe, in just 6 weeks the campaign earned 100 Million impressions and 4 million Euros in coverage. The 50 with Lidl products branded arenas generated more than 100.000 hours of branding during the tournament. Lidl as a brand with 11 Million Facebook fans has taken the next step for social communication by connecting the digital and the physical world. Lidl’s first step in the world of social media focused on games and product information; in this case it was a clear step towards Internet of things, including game and own brand advertising. After testing and prototyping we started the analysis and chose third parties to help us with the serial production of 52 tables. This was not an ordinary project for an agency, because it isn’t just an application or a Facebook app or just a website. We had to use real hardware and machine controls to operate 50 tables with100 fields including steered motors. We implemented micro controllers that directly programmed hardware motors and read the sensors. All in all, the software is a multi-layered construction. On the one side we had the web application, so the Facebook app, and then on the other side the tournament controls, where the tournament process is steered. Here the results for every game are collected. They are intertwined and independent of each other, everything has to work together in order to create the overall effect, thus making it more complex than the usual applications. Using video technology is also not common for such a project. A database is included, which records all current scores and results. Then we also have the table controls, so 50 tables and 100 playing fields that need to be coordinated and reserved. We made live film footages of the games, video recordings that are transferred to an asset server into the application and additionally equipped with trailers. Only a maximum of 10 seconds passed between the recordings and the viewing of the reworked videos. The software is split into four computer centres, one of which is a computer centre that is with our client itself. The tournament controls, the table controls have their own computer centre that is placed near the arena. And then we had another one for the video production and rework, which is with a specialist. In the arena we installed continuous LAN wiring between all tables and video recorders, which means all devices are available via standard LAN/ Internet. This means we actually had 50 tables and Internet wiring with routers and switchers. The infrastructure resembled a LAN party.